A report today by Will Worley on the latest Palestinian terror attack in Hebron in The Independent (Teenage girl wielding knife shot by Israeli security forces in West Bank, Feb. 14) concluded with context on the recent violence. There has been an increase in violent attacks on Israelis since October last year. Twenty-seven Israelis have been reported killed in stabbings, shootings and after being rammed by vehicles. At least 157 Palestinians have been killed by Israeli security forces in the same time. 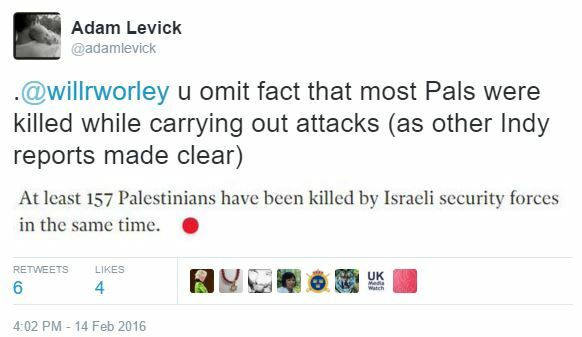 Worley of course fails to note that most of the 157 Palestinians in question were killed while carrying out or attempting to carry out terror attacks against Israelis – a fact that other reporters writing for The Independent have been careful to note. Here’s the relevant passage in a Jan. 23rd Indy report by Lizzie Dearden. Since the start of that month, 27 Israelis have died in stabbings, shootings and car rammings, while at least 155 Palestinians have been killed by security forces, including 95 said to be attempting or carrying out attacks. Since the unrest started at the beginning of October, 24 Israelis and one US citizen have died in a series of stabbings, car rammings and shootings. At least 148 Palestinians have died, 98 of whom were behind attacks, according to Israel. We’ll update this post when the Indy responds to our complaint or the journalist responds to our tweet. Antisemitic rag lies about Israel. I’ve never commented here but I now must. UK media Watch is the best. Adam Levick, thank-you for your continuing efforts to shed light on the horrific antisemitism that is so rampant everywhere it seems. Our CBC is almost as bad as the BBC. The Globe and Mail newspaper is almost as bad as the Guardian. I have several University students who live with me. They have changed over the years as they’ve graduated, so I’ve had a lot of them and a lot of time to educate them. I show them the Pallywood videos, this site and many others and have many discussions with them. The upshot is that not one has not become a staunch Israel supporter. Because they are smart and able to discern facts from propaganda. One Jewish young woman (20 yrs old) was scared to tell anyone that she was Jewish. I spent a lot of time with her and she became aware that hiding the essence of who she is, was dehumanizing. Some of them have actually taken on the BDS know-nothings that sit at tables in the students union building as well in class where lies, hate and misinformation is rampant. It is a delight for me to see. My son did Birthright just before he started University. He was well equipped to handle the flack when he returned. This is no different than the Gaza War when Western Media refused to address the fact that Hamas runs an army built with their youngest civilians at the front of the line. The Independent won’t provide any context for their numbers because they love the blood and the belief that Israelis really are bloodthirsty, cretinous creatures. This helps sells papers to billions of rabid anti-Israel freaks rather than the millions of Israel’s supporters. Only in the West does the smartest guy in the room actually try to be its biggest fraud.